A 5-part guide to maintaining communication, culture, and quality of work as you take your technical team remote. Your ultimate guide to building & leading a remote engineering team. We created this guide to help technical leaders think objectively about the pros, cons, and tradeoffs of working with a remote technical team. Read on for a chapter-by-chapter preview of what's included in the guide. We see a clear pattern of top engineers choosing to work remotely. The new formula for building a great technical team likely doesn't include just one zip code. 74.92% of respondents from a 2018 State of Software Development Survey said remote work is encouraged at their company. Unsurprisingly, not all of us were cut out for that #RemoteLife. Maybe you despise working and are hoping to take a lifelong vacation under the guise of remote work, for example. Or you’ve never used a computer. Not you? Great. Still, if you’re considering shifting your product team to a remote model or pursuing remote engineering work yourself, we encourage you to do some soul searching before diving in. We’re evolving the way we work. 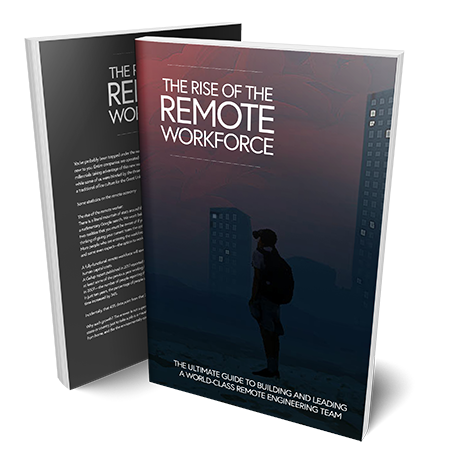 The intersection of the technology and tools required to facilitate communication paired with our collective appetite to create more meaning, balance and flexibility in our personal and professional lives has lead to the rise of the Remote Workforce. There are thousands of businesses across the world opting for some level of remote work, with varying degrees of success based on myriad factors. Here are the stories of three technology companies doing it incredibly well. 74% of 1,000 office workers surveyed said they would leave their job for another that offered the option of more remote work. You gotta have a sweet set of tools. If you’ve made the decision to embrace a work culture that accommodates remote employees, there are a handful of practical tools you’ll need to invest in in order to make it work. We’ve outlined the essentials across communication, project management and code promotion that constitute the essential must-haves for any remote technical team. Gun.io provides a risk-free way to work with elite freelance talent, remotely. Get in touch today to learn more about our unique service.